I am feeling very happy and excited to host my first event to mark my celebrations , crossing 150th posts .First of all, I would like to thank my encourager, my hubby who inspired me to start this blog! Thank u, Sweet Heart!!! And I like to thank my mom specially because all the recipes I have posted so far is all from her kitchen and I learn from her only what cooking is! Thank you Mom!! !A heartful of thanks to u all who encouraged me to reach this peak !! !Thank you for all your support and suggestions for these achievements.I couldn't have achieved this without you.. When my husband saw my enthusiasm, he came forward to sponsor one prize of worth $10. Thanks my dear hubby! Please go through the instructions and include all the required information in your post when sending me your entry. 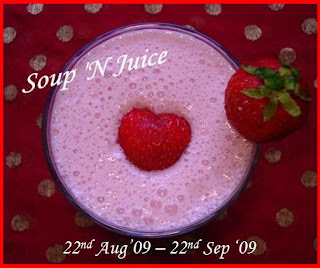 The theme is Soup 'N Juice. You can post your favorite fruit juice/cocktail /lassi /shakes /smoothies and any Soups (without eggs). * Photograph of final dish(Any size). 4) The deadline for this event is September 22nd '09. Please remember that no late entries will be entertained. 5) There is no limit to the number of entries. 6) The roundup would be published during the first week of October. 7) Top 10 entries will be selected randomly among all the entries. 8) Voting will be conducted to select the winner among the 10 entries. Superb event Sireesha, will send something..
Great event"" will try to send some recipes..
Nice event sreesha will send some soon. Happy hosting Sireesha :) I do have many soup recipes in my blog, I can send them. Great event dear, I'll send you something soon. Nice event sireesha will send some soon.Happy hosting! Gr8 event...will def send something soon!..u ve a wonderful blog..congrats! Very nice event dear, will try to send many recipes. Nice theme dear. I will send my entries soon. One doubt dear, Does Rasam come under the soup category? Thank you for the wishes dear Sireesha!! Hope you had a wonderful Vinayaka Chavithi too!! I will try to send some entries for your nice event. Happy Hosting!! This is a very nice theme. Will try to send something!! COngratualtions on completing 150 posts..will definitely participate in the event. Thanks for the invitation to participate in your event. I have sent my entry. Nice event, Sireesha. Will definitely try to send you something. Congrats.. will try to send some today dear! All the besT! Nice event. Will try to participate. Sent my recipe entry.. hope you have received it. Congrats on ur 150 posts! Great event for summer . Nice event!! Let me give it a try! Will surely send you some entries. Sent my recipe entry..hope you have received it. Lovely blog, I will miss this event, as just now, I came to know about this. All the best. Sure, I will participate in the next event!! !